How are YOU celebrating AAC Awareness Month? Welcome USSAAC members and guests to our virtual SpeakUp publication, in blog format since July, 2017. October is International #AACAwarenessMonth and USSAAC is celebrating! I’m worth the wait, let me communicate. 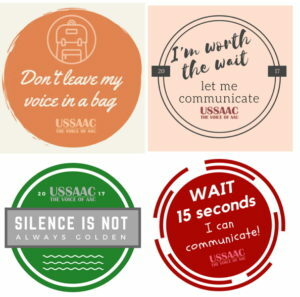 Rachael Langley, a member of USSAAC’s Committee of Public Information, worked her graphic design magic and turned these tag lines into beautiful images for you to download. These images can be printed on adhesive paper and turned into stickers, used to make buttons, shared on social media or used in any other creative ways you can imagine! Download them for free by visiting http://bit.ly/AACAwareness. The Awareness Committee is also hosting a free webinar on October 23rd entitled Model the Way. Currently employed for the U.S. Government, India Ochs has been involved in advocacy issues for over thirty years and is a person who uses AAC. She will speaking about leadership along with her second grade son, Jack. Did you know that USSAAC members receive priority registration for all USSAAC webinars? USSAAC members, keep an eye out for an email from USSAAC with registration information for this exciting event. USSAAC also has many more blog posts coming this month in honor of AAC Awareness. Bookmark this page and visit regularly! How are YOU celebrating AAC Awareness Month? Please share with us in the comments or tag @USSAAC on social media and include the #AACAwarenessMonth hashtag. If you have an AAC Awareness Month event you’d like added to the USSAAC calendar, please email membership@ussaac.org.